Offering same day flower delivery to Worthington for more then 25 years Flowerama has become Worthington Residents favorite florist. Flowerama backs this statement up by being the winner of the Consumers Choice Award for six straight years. 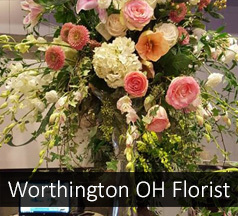 The design team at Flowerama is so fond of Worthington they even created a signature arrangement for the city called "Worthington Garden of Dreams". We can even offer express delivery of this flower arrangement in Worthington, look for "Cupids Express Delivery" at our check out page. With Four locations, award wining service, great prices on flowers, a world class website, its no wonder Worthington has made Flowerama it's florist of choice.